Ideal for use in areas with limited access to water and sewerage disposal. The use of pit toilets is not uncommon in South Africa, as they are often the only solution in areas lacking water infrastructure. Preferably one with a seat/lid. It is advised to build the pit toilet away from the main dwelling and community water sources in order to prevent contamination of the water supply. The depth of the hole will depend on the amount of people that will be utilising the toilet, as well as the frequency thereof. It is advised to dig a hole that is at least 3m deep and 1m wide. Note: As the hole fills with sewerage, bacteria breaks it down into effluent. If the hole fills up too quickly, there is not enough time for this to take place properly. 3. A slab/floor with a small opening to cover the hole or “pit” where the sewerage will be stored. 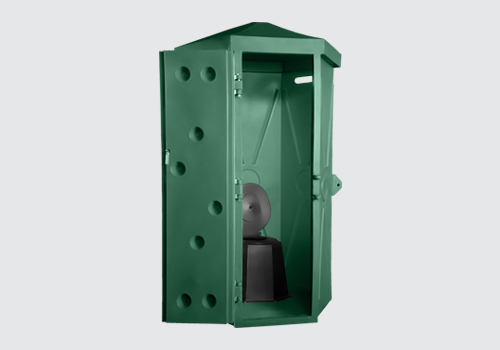 To cover the pit toilet and provide privacy and shelter from the elements. This is a guideline for a basic installation. Each installation will vary based on the setup and personal preference and should be done according to local legislation to avoid water pollution and public health risks. Regular cleaning with anti-bacterial agents are vital to effectively manage bacterial problems in and around the toilet. Once the pit fills to within 0.5 meters of the top, it should be filled up with soil and a new pit should be constructed.